While I know it's France and dogs are allowed in many stores and most restaurants, I was still surprised to see dogs allowed entry to the gardens at Villandry. The château and gardens are privately owned, but it still surprised me. I wonder if they have to pay an entrance fee? Part of the castle's forecourt, seen from the terrace above. As you can see in the sidebar, our weather is transitioning from very mild to more seasonable. Our highs are going down into single digits now and for the foreseeable future (which, granted, is not very long where weather is concerned). Yesterday I ordered home heating fuel to take us through winter. I got a really good price compared to previous years as the price of oil has been dropping lately. And the wood pile is stocked and ready to go as well. Part of the fun of Thanksgiving in the U.S. is that there are so many good leftovers. We're no exception and we have, in addition to the lamb, more pasta and filling for ravioli and a couple slices of pumpkin pie. I'll be making more ravioli today for lunch and Ken may do up a curried cream sauce for them. This is the pumpkin pie that I made using buttercup squash from our garden. 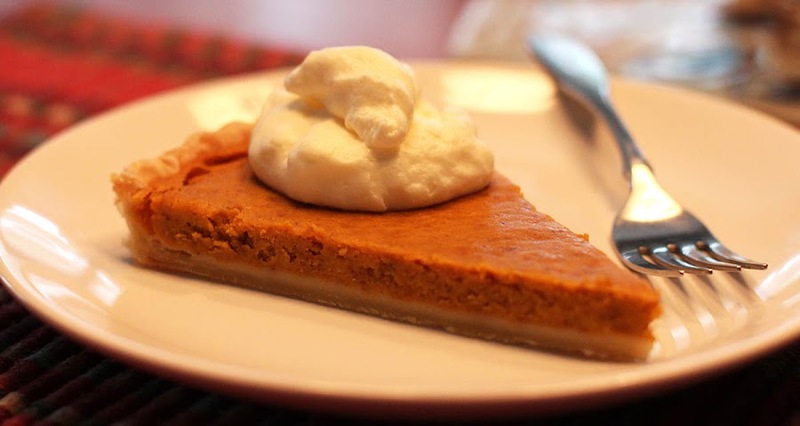 When I make this style of pie, I use an American recipe as a starting point, but I reduce the amounts of sugar and spices so that the flavor of the pumpkin comes through. I really like it that way, but I may be in the minority. I serve the pie with a dollop of slightly sweetened whipped cream. That's all the food photos I have. 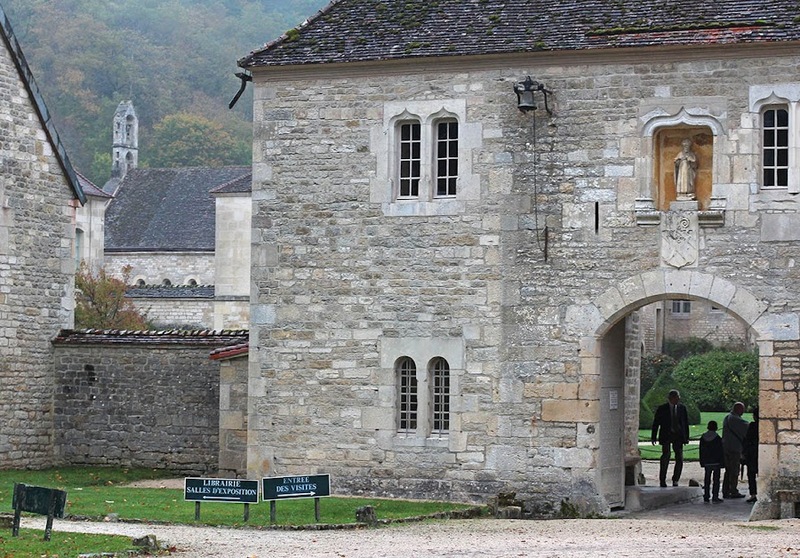 Tomorrow we'll go back to Villandry. Preheat oven to 220ºC (425ºF). Mix sugars, salt, spices, and lemon zest in a large bowl. Beat the eggs and add to the bowl. Stir in the pumpkin puree. Stir in cream. Whisk all together until well incorporated. Pour into a re-baked pie shell and bake for 15 minutes, then reduce the heat to 180ºC (350ºF) and bake for an additional 40-50 minutes. If the surface of the pie begins to crack, reduce the heat further. Let cool for two hours, then serve with whipped cream. It's just a regular Friday here in France. No crazy shoppers, no "black Friday" sales. Even if the phenomenon did get a mention on today's morning newscast, it's still just another American curiosity. Our Thanksgiving feast went well. I took two photos, and only one came out well enough to share. 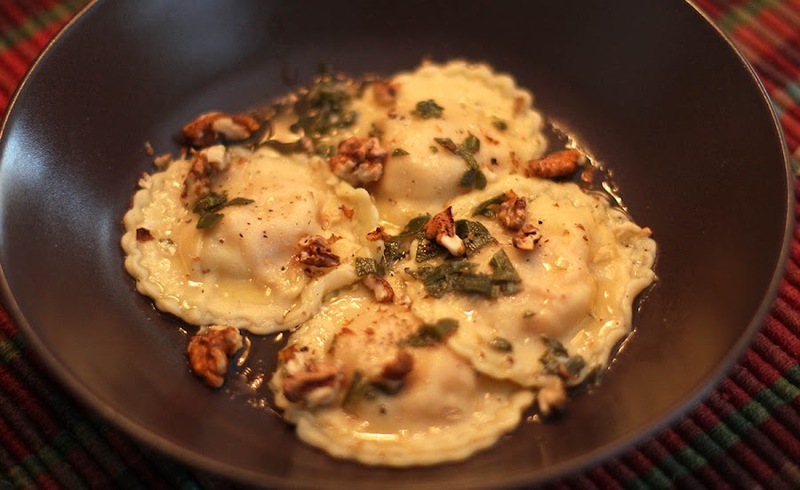 It's our entrée (first course), my home-made pumpkin ravioli in a sage butter sauce with walnuts. Pumpkin ravioli -- I even made the pasta myself. The roast leg of lamb was tasty and the pumpkin pie with cream went over well. The dessert was the only nod to the American culinary traditions of Thanksgiving, although my pumpkin pie is much less sweet and spicy than those I remember. Afterward, we had a rollicking game of French Monopoly. It was an older game, so the currency was in Francs. Hundreds of thousands of them. I was the first player to go bankrupt. The first thing we did at Villandry was to wander through the château itself. While I'd been to the gardens before, I had never been inside the castle. The funny thing is that I took no pictures inside. It was nice, furnished as it might have been in the eighteenth century and there was plenty to see. But I never snapped a photo. 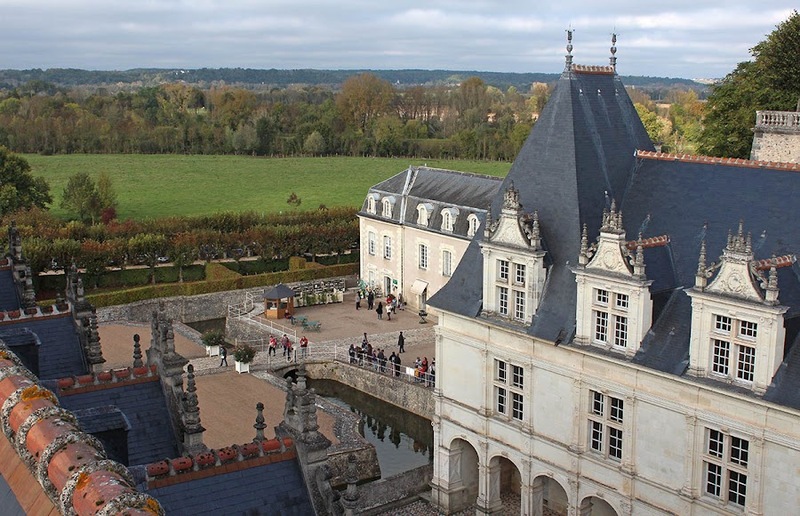 Looking over the Loire valley from the castle's rooftop terrace. Toward the end of the circuit we climbed a stair up onto a terrace in the older tower and were treated to sweeping views all around. That's when I rediscovered the camera. 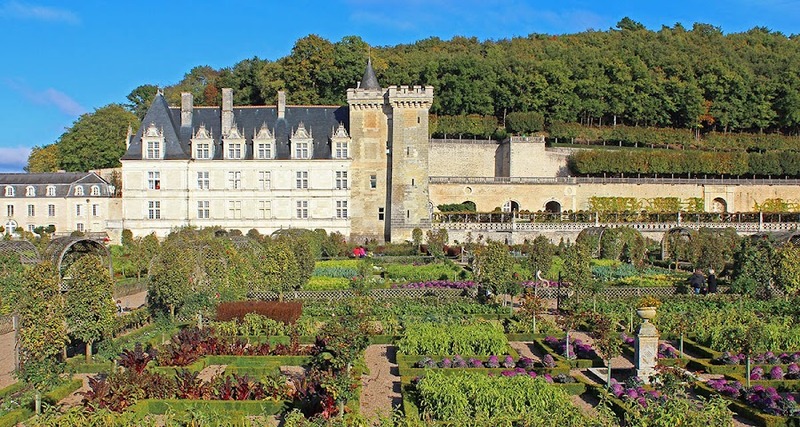 After my friend C. and I left Azay-le-Rideau, we drove the short distance to the castle at Villandry which is know more for its elaborate gardens than anything else. The gardens are done in the French style: vast geometric parterres framed with intricately shaped hedges and filled with colorful flowers and plants. 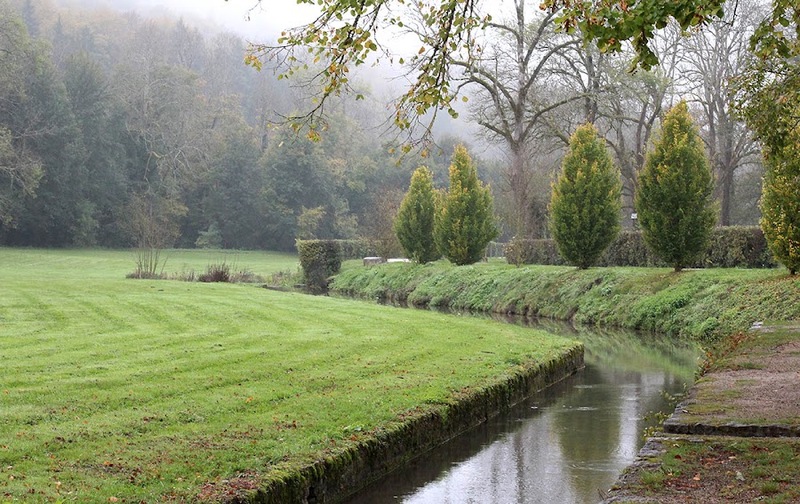 The gardens are separated by majestic allées and occupy several different levels of the riverbank. Looking east over the vast kitchen garden toward the château at Villandry. Back in San Francisco, nearly every weather forecast was the same: patchy morning low clouds and fog, clearing to the coast by mid-day. Day after day. Actual rain was a big news event, even more so in times of drought. We don't have that problem here. But, like clockwork, the November fog is upon us. Fog forms in the vineyard at sunrise. On this day, it didn't get very thick and it burned off quickly. It's not at all like San Francisco fog in that it's not borne in by wind. The air is still when the fog forms at sunrise, often after a crystal clear night. High pressure keeps it tacked to the ground for most, if not all, of the day. 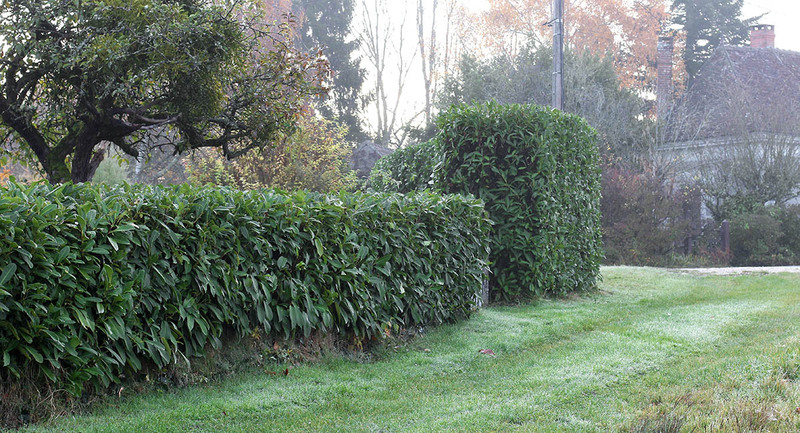 If you noticed the newsiness section last week, you saw that our hedges got trimmed. Ever since I did my back in doing them myself a few years ago, I've contracted the job out. I think this is the third year that a local gardener has done them. The gardener's employees, two or three younger guys, arrive with all the proper equipment to tackle the hedges: several trimmers, including one on a very long pole to reach across the hedge, and a mobile scaffolding that allows easy access to the top of the hedge without using ladders. The rounded shrub behind the transformer box is a laurier-sauce (bay laurel) which provides the flavorful bay leaves that we use in cooking. The guys do great work, have the whole job done over two short days, and clean up and haul away the debris when they're done. It's hard to tell from the photo, but this section of hedge is about eight feet high and is, in places, nearly five feet across. The rest of the hedge (see the photo below) is only about four feet tall -- the guys cut it down for me two years ago. I continue to trim those sections myself since there is no ladder work involved. You can see the difference in height between the short and tall sections from outside our back gate. So, the job is done again for another year. 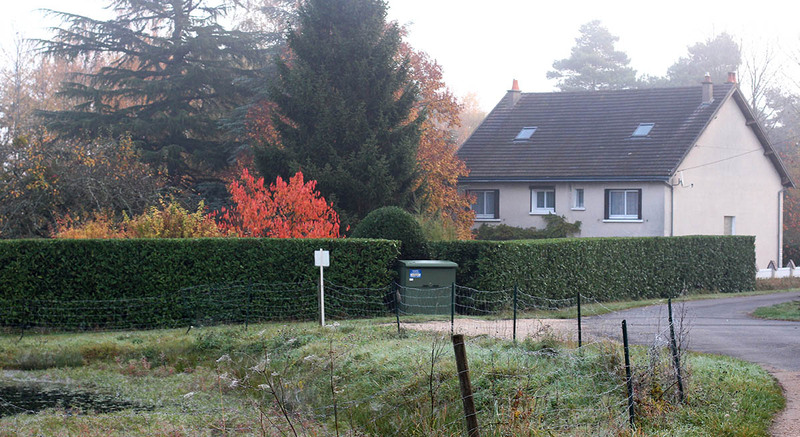 I'm thinking that next year I will ask the gardener to cut down another large section of the hedge to four feet (the part to the left of the transformer box in the top photo and a similar section on the other side of the house). That will leave only the section along the road at eight feet high. Maybe one day we'll have that cut down to size as well. The shorter hedge was very bare the first year after it was cut down, but since then it's filled in nicely. I just thought I'd throw in a third photo because I like it. 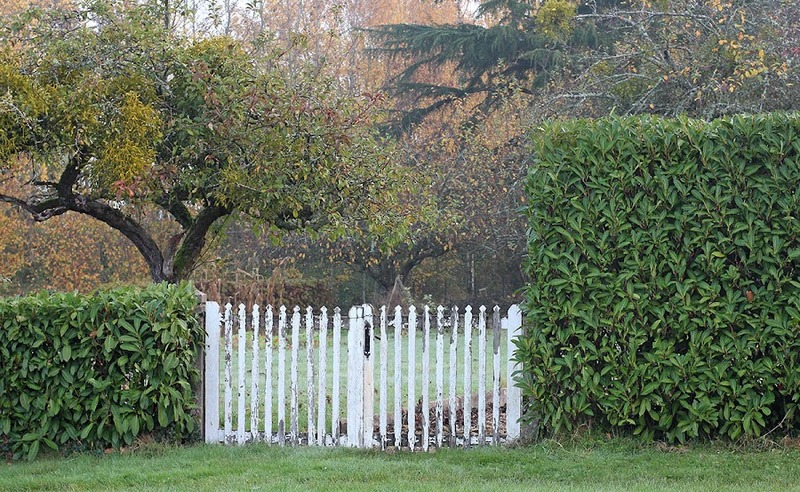 It's the same sections of the hedge on either side of the gate seen from a different angle. You can barely see the gate, but the difference in height of the two hedge sections is quite dramatic. By the time my friend C. and I left the château d'Azay-le-Rideau, it was lunch time. There was a festival/flea market set up in the streets of town and we saw a wide variety of street food available, including big steaming pans of paëlla and choucroute. But it was a little too chilly and damp for eating outside and I think we both felt like a sit-down meal indoors. We walked up the street to the main square in town and found a restaurant that looked inviting. They advertised moules et frites (steamed mussles and French fries) for a decent price and that instantly appealed to us both. View from inside the restaurant La Salamandre in Azay-le-Rideau. Lots of appetizing choices. And it was very, very good. We had a nice leisurely lunch, including some local Azay-le-Rideau rosé wine, and finished up with a coffee before heading back to the car. 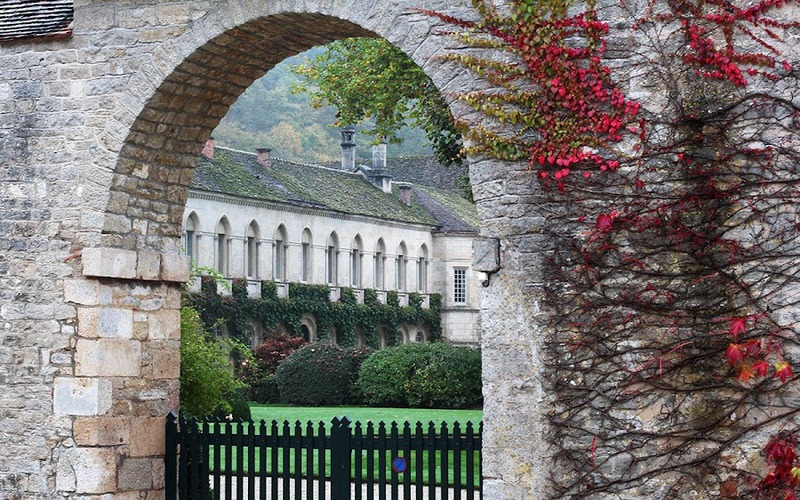 Our next stop: the château and gardens at Villandry. The town of Azay-le-Rideau is very nice. These days it's all done up for the tourist trade because the château is a big draw. There are all manner of shops with crafts and artsy things, specialty foods, and trinkets for any budget. And there are restaurants to please everybody. On our way to the castle gates. 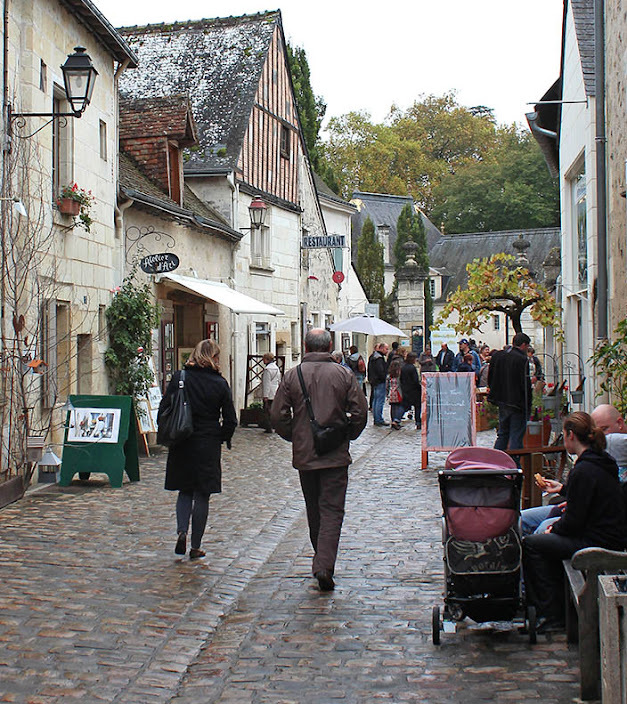 This is the street that leads from the main square in town to the gates of the château. I was attracted to a few of the shops, but we had a castle to see, so on we went. As you climb the main staircase in the château d'Azay-le-Rideau, there is a balcony on each level that is open to the courtyard below. This is part of the western wing seen from the highest level. The castle is shaped like an "L." I read somewhere (I don't remember where, now) that one of the owners had plans to add to the castle to make it a square, enclosing the courtyard, but the plans were never carried through. A portion of the western wing and its round corner tower. There are two options for seeing the interior: a guided tour or a self-guided tour. Visitors can rent headsets to hear descriptions of the rooms for the self-guided tour, or they can do what we did: wander around just looking. There is descriptive information posted in each room, but you have to wait for the person ahead of you to finish reading. At one point in our wandering, we bumped up against a guided tour that had the whole place blocked up. We stood, with other wanderers, in a tiny spiral stairwell for about five minutes before we were able to push and shove our way through to get ahead of them. Back in the days before modern techniques made large plate glass windows possible, smaller glass panes were normally fitted between leaded mullions to create intricately patterned windows that, while they let light in, did not provide the clearest of views toward the outside. 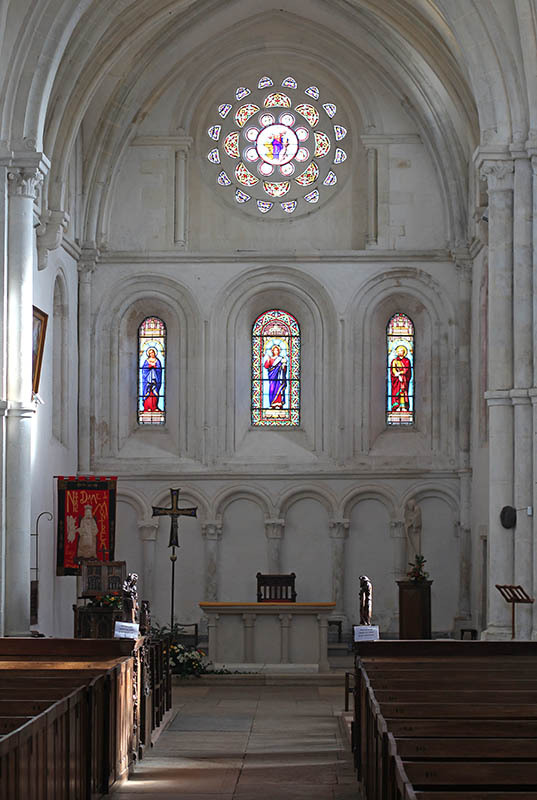 Stained glass windows are a common example, but clearer glass would be used in the renaissance residences of the aristocracy. Small pieces of relatively clear glass, but with lots of distortion, allow a decent amount of light into the castle's main stairway. 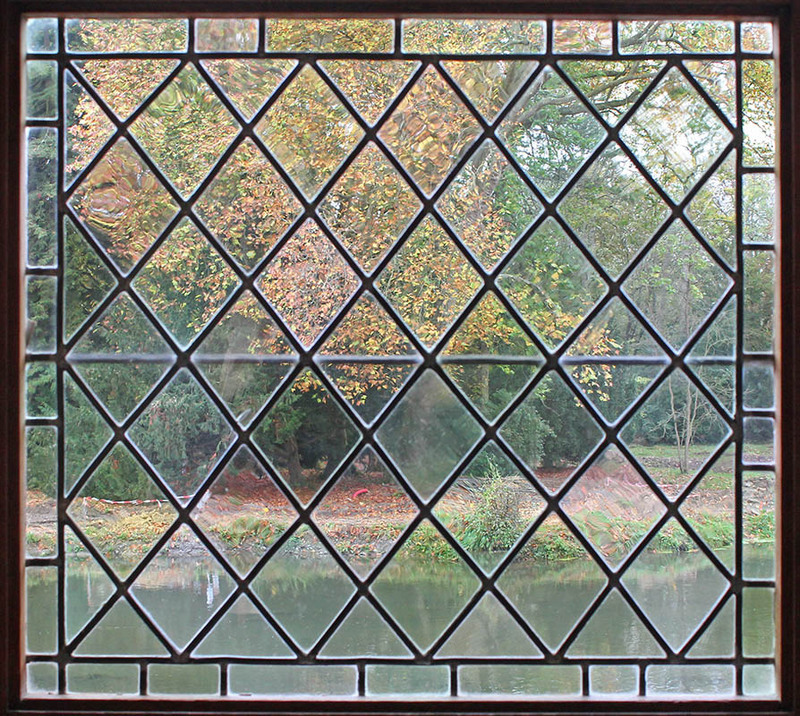 This is an example of that kind of window at the château d'Azay-le-Rideau. I don't know enough about the castle to tell you whether this is an original window or a reproduction made during one of the many renovations/restorations that have been undertaken over the centuries. Still, it's quite pretty. 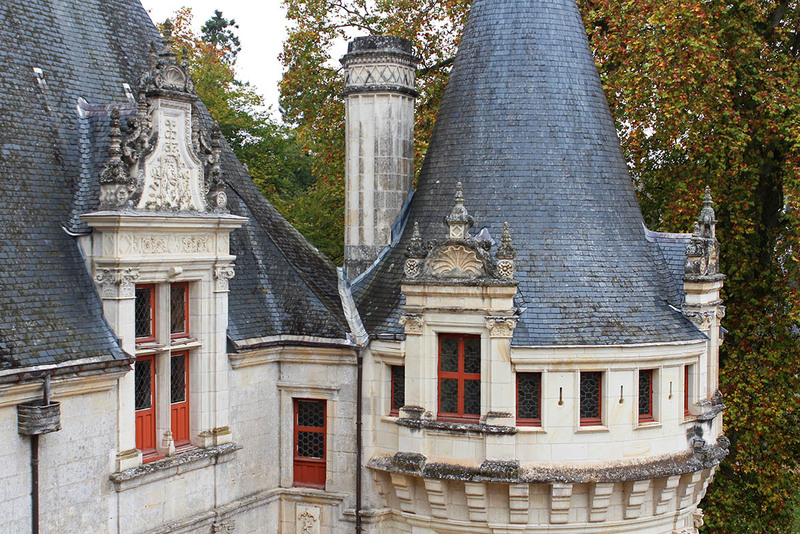 As in most of the Loire Valley châteaux, the stone work at Azay-le-Rideau is replete with sculpted elements. Everywhere you look is another example of more or less intricate carving work. From decorative to emblematic, the carvings are a reminder of the amazing skills of those who built these castles. The salamander and the ermine, royal symbols. These are just two examples. The first is a bas-relief above the castle's main entrance. On the left is the salamander, symbol of king François Ier, with a banner that includes his devise (motto), "Nutrisco et extinguo" (I nourish [the good] and extinguish [the bad]). On the right is the hermine (ermine or stoat), symbol of the queen, Claude de France. The ermine was the symbol of Bretagne (Brittany) and of Claude's mother, Anne de Bretagne, queen of France. Claude's father was king Louis XII. It looks like there's a banner above the animal with nothing written on it. I don't know if that's intentional or a partial restoration; it looks like some background elements are also missing. 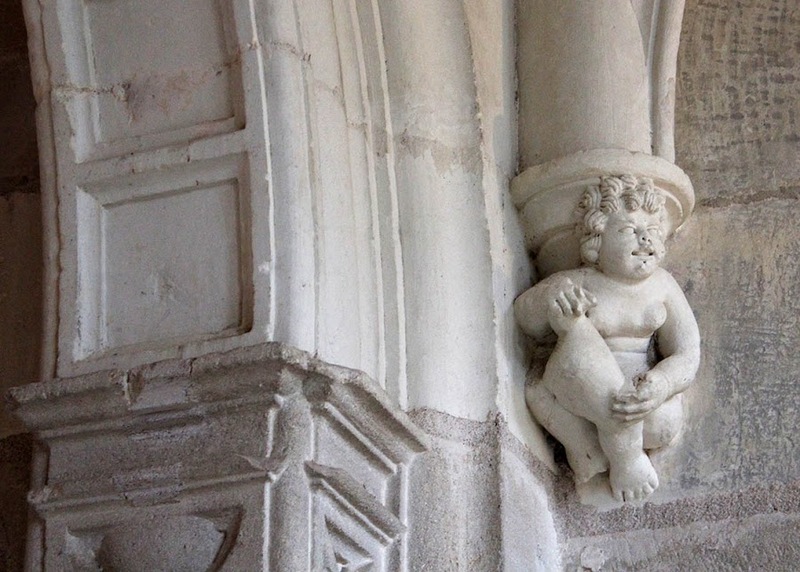 The second sculpture looks to be a cherub that adorns the base of a ribbed vault in one of the castle's corridors. There are a lot of these around and whatever symbolic significance they have, beyond the purely decorative reflection of religious idolatry, I do not know. ...Who's got the prettiest castle around? Azay-le-Rideau sits on an island in the middle of the Indre River. 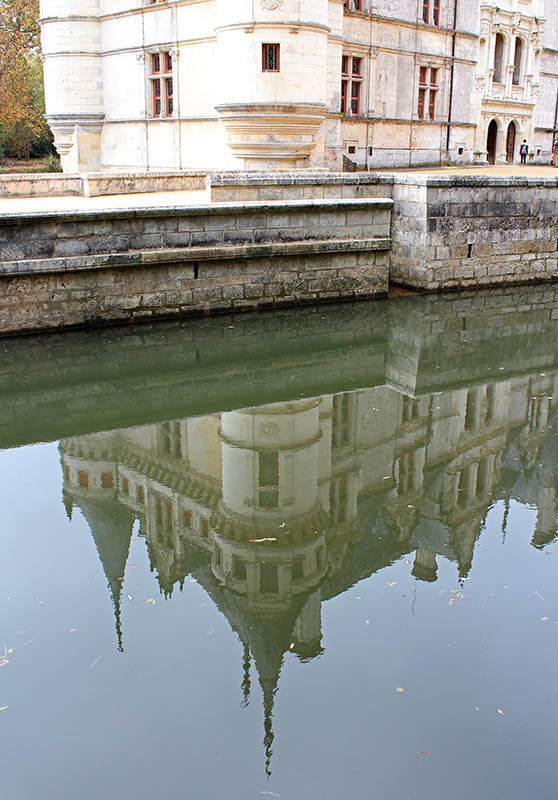 The river's flow is controlled to create a slowly moving reflecting pool around the castle. Since the park behind the building was closed (where the best and most famous of views are), I had to try to find reflections in other parts of the river. The bridge you see is the same one from yesterday's photo. I took these two photos from the same spot on the river's right bank across from the castle's entrance. Since it's fall, there are hundreds of tiny leaves floating on the water's surface. 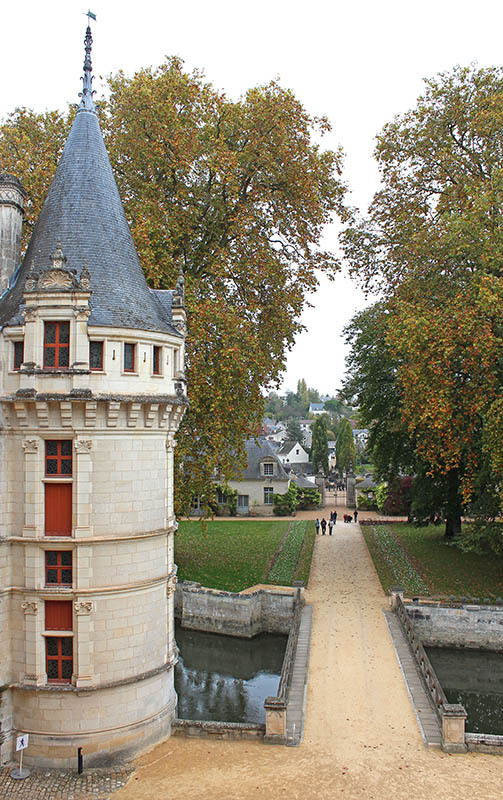 No need to swim the moat at Azay-le-Rideau; there's a nice bridge, and it's not a drawbridge. The original medieval castle that stood on this site has been completely replaced (over several centuries) by the current renaissance residence. 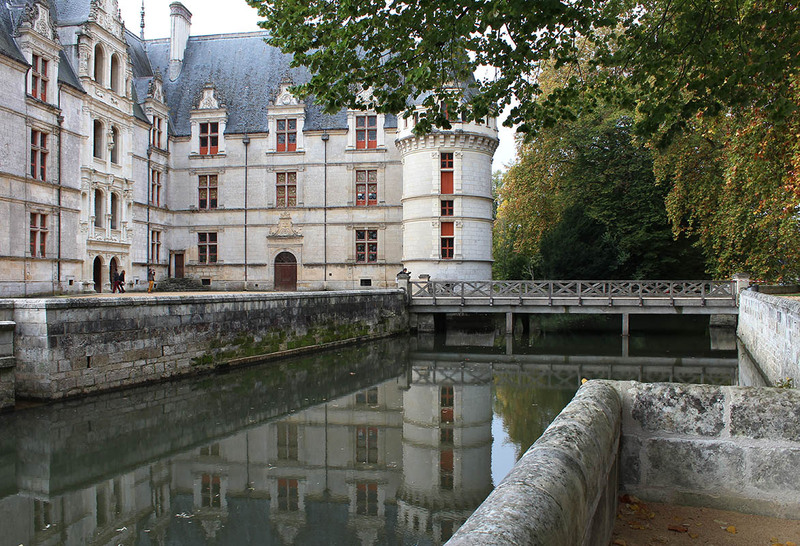 The castle is built on an island in the Indre river which is carefully managed to slow its flow, creating a calm mirror-like effect around the building. Looking back toward town and the entrance to the castle grounds. Because of the restoration work in the park that surrounds the castle, we were not able to see the classic view from behind where it looks as if the castle is floating on the water. Still, I was able to get a few water shots. Stay tuned. 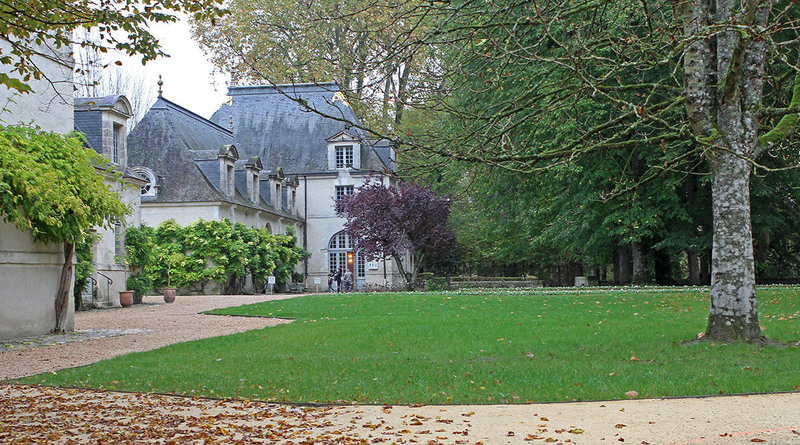 When you visit the château at Azay-le-Rideau, you enter through one of the buildings that frame the forecourt of the castle grounds. This building is also where visitors exit and where, naturally, the gift shop is located. It also houses the public rest rooms, just through the large doors where the people are standing in this photo. The building where the toilets are is bigger than my house. When we got our tickets, I noticed that the price was lower than what was posted. I didn't understand why until we got inside (because I didn't bother to read the sign that probably explained it very clearly). The castle grounds are undergoing renovation and most of the park was closed to visitors. So they knocked a couple of euros off the entrance fee. You may know that line if you ever watched Monty Python's Flying Circus back in the day. Recently I was reminded of it while watching the national news on France 2. The anchor woman has taken to saying, "Et maintenant, tout autre chose," to transition from one news story to another. Whenever I here her say it, all I can think of is John Cleese saying, "And now for something completely different." It makes me laugh every time. I wonder if she knows. Approaching the sixteeth century château d'Azay-le-Rideau. 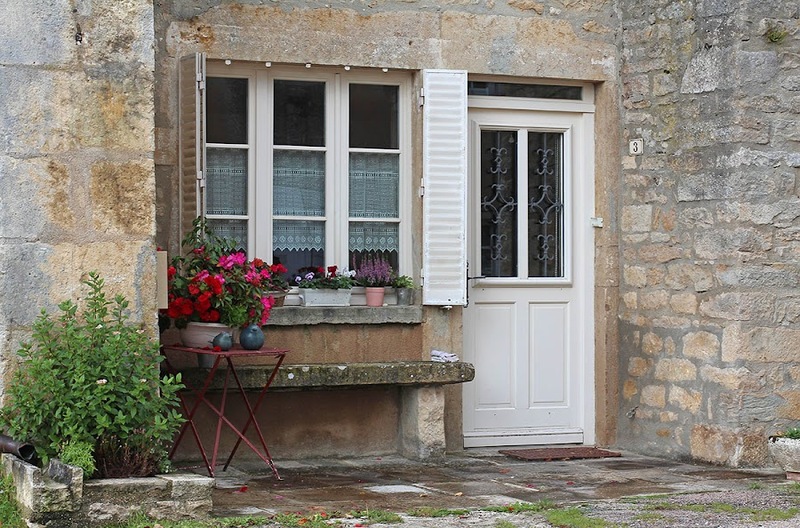 So, I've finished with the photos from our short trip to Burgundy. The day we returned, we welcomed a friend from California for the weekend. We had a great time eating, drinking, reminiscing, and otherwise catching up. She had enrolled in an intensive language program in Tours and had just finished her first week of classes. On Sunday, I drove her back to Tours. 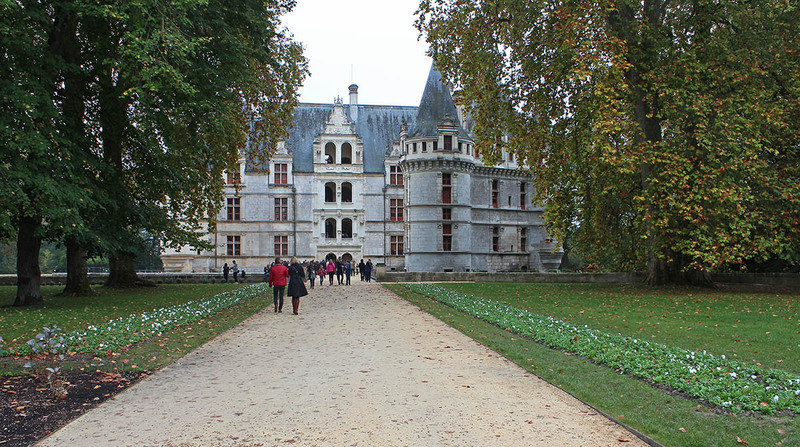 We stopped along the way to visit two famous Loire Valley castles: Azay-le-Rideau and Villandry. Naturally, I took the camera along. 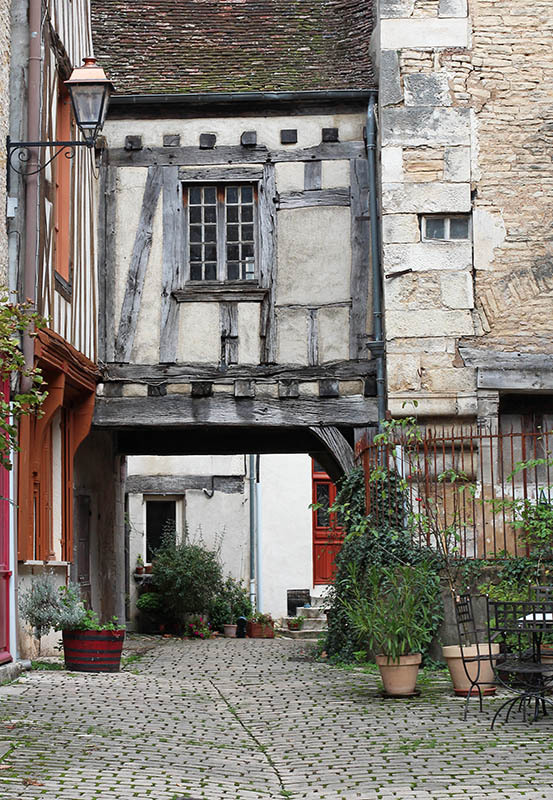 The closest town to where we stayed in Burgundy was this amazing remnant of a medieval fortress called Noyers. It's pronounced [nwah-YAIR], which is completely different from the way the town across from us is pronounced. It's spelled the same, Noyers, but is pronounced like this: [nwah-YAY]. We bought food here. Yum. 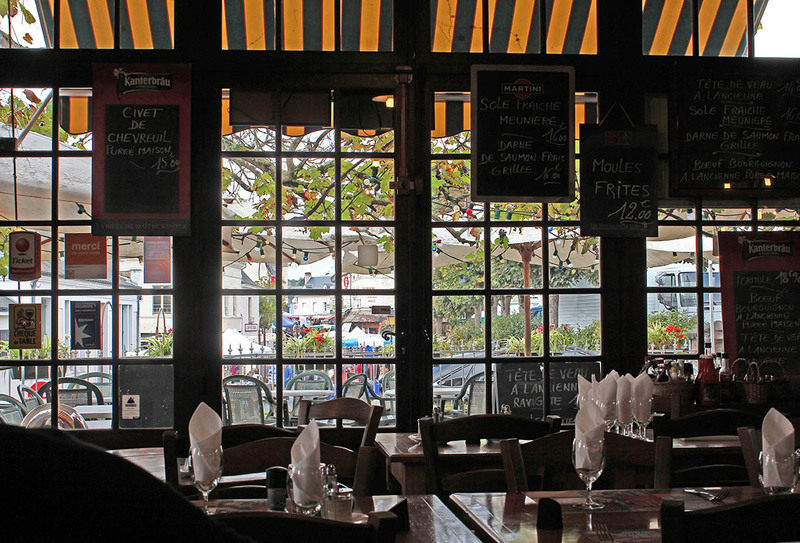 The town has many historical sites, but it also has a renowned restaurant and deli. We did not eat at the restaurant, but we did buy some food from the deli. Among the specialties there is jambon persillé, or ham in gelatin with parsley. And it was very good. Behind the store is a picturesque street where their restaurant is. We also bought some patés and a loaf of whole grain bread. All very good. We walked around the town for a while because, when we arrived, the stores were closed. We had to wait for them to open again to get our goods. And we are very glad we waited. Because she's a pretty dog. She was sitting on the carpet after a short play session. Ken called her name as I snapped the photo, so she's looking at him. 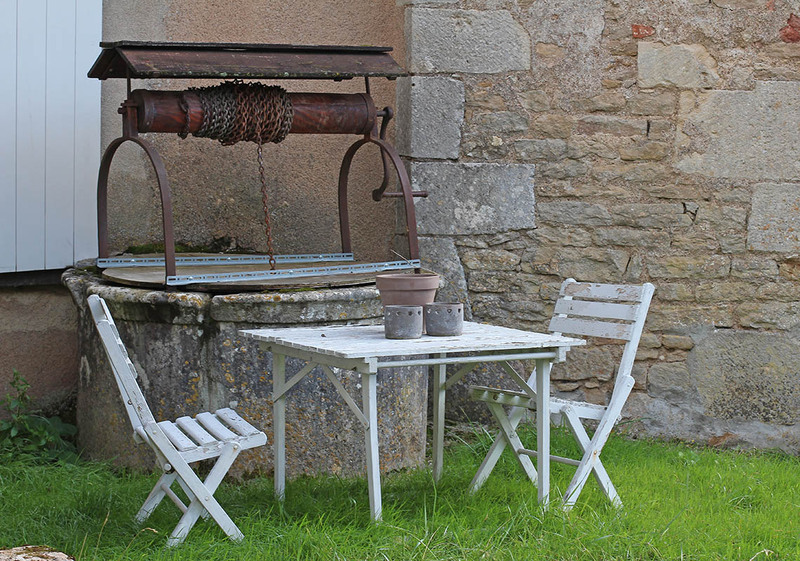 A well and a table. 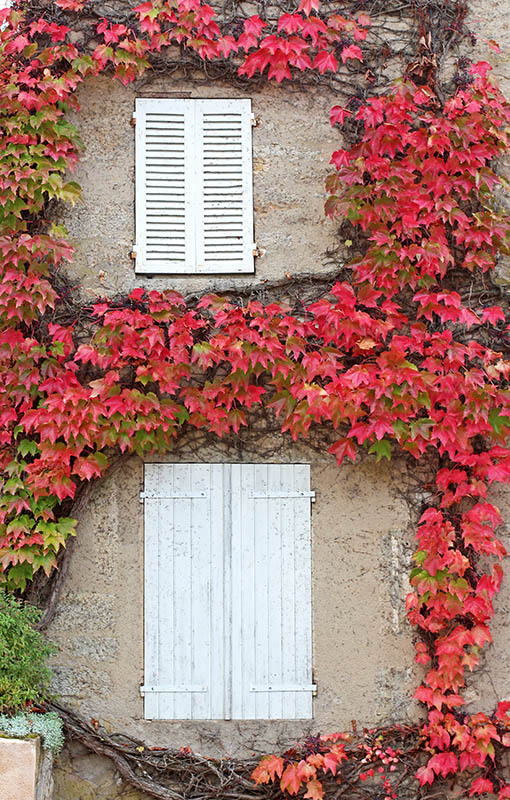 Vigne vierge (Virginia creeper) turning its autumn color. Here are two stone walls I saw in Montréal (Yonne) a few weeks ago. They're both retaining walls built along the steep street where the lower town meets the upper town. And while the townspeople would prefer us to go in a certain direction, we are not obliged. The second wall had a door in it that has been sealed up. I don't know when or why, but it looks recently cleaned and/or renovated. 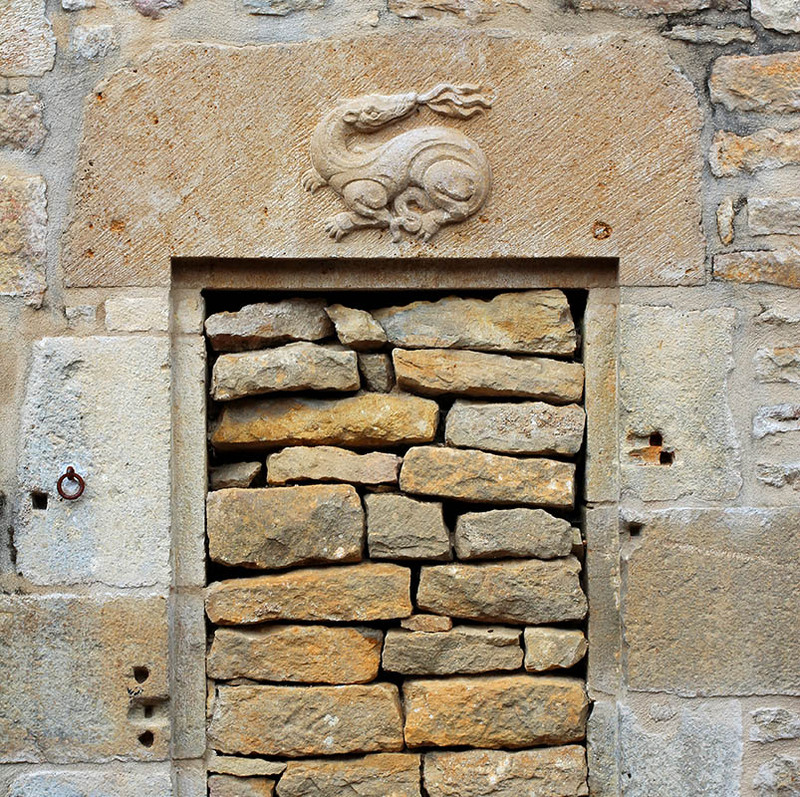 The sculpture above the door looks like king François Ier's royal emblem: the salamander. You really have to want to go through this door. Wasn't that a Woody Allen movie? I'm talking about the inside of the church in Montréal (Yonne). Like I said before, going inside was a last minute decision. I went first while Ken stayed outside with Callie. It's a jewel of a place. And because I was limiting my photos with the 50mm lens, I couldn't get wide shots inside. I had to make do with close ups. But I'm not complaining. I probably saw things close up that I may not have if I had the wide angle lens. The widest shot I could get of the altar. 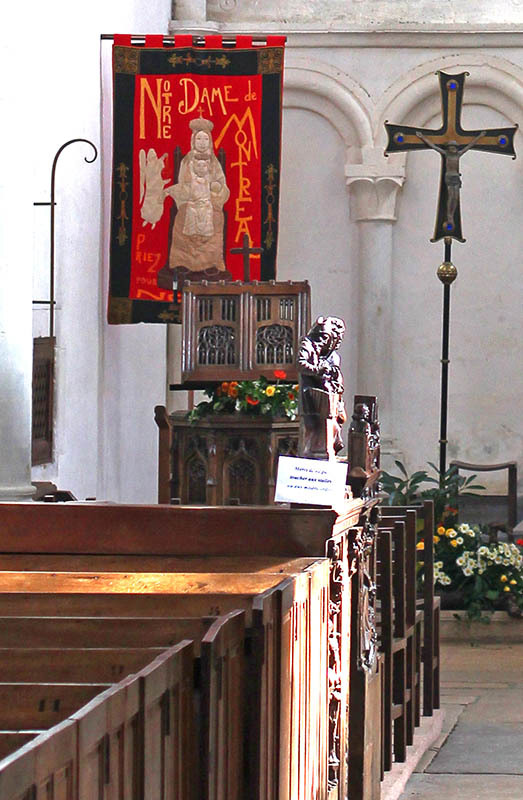 Some of the seating in the church, ornate pews called stalles, is adorned with intricate carvings. The stalles were built using funds donated by king François Ier. He enjoyed the reception he got while visiting Montréal and decided to give them some money which the monks used to have these carvings made. 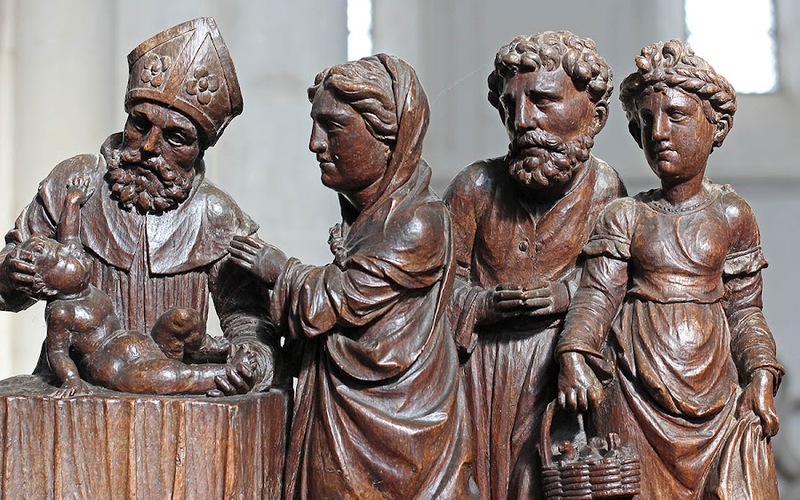 This carving is called "The Presentation of Jesus at the Temple." There's not much more to say about this place. I was inside for all of five minutes. Ken took a lot more photos inside than I did. Maybe he'll post a few on his blog when he gets done with the Paris pictures he's currently doing. A close-up with a recently embroidered banner. The collégiale church in Montréal (Yonne) was built in the twelfth century as the romanesque architectural style was transitioning into the gothic style. 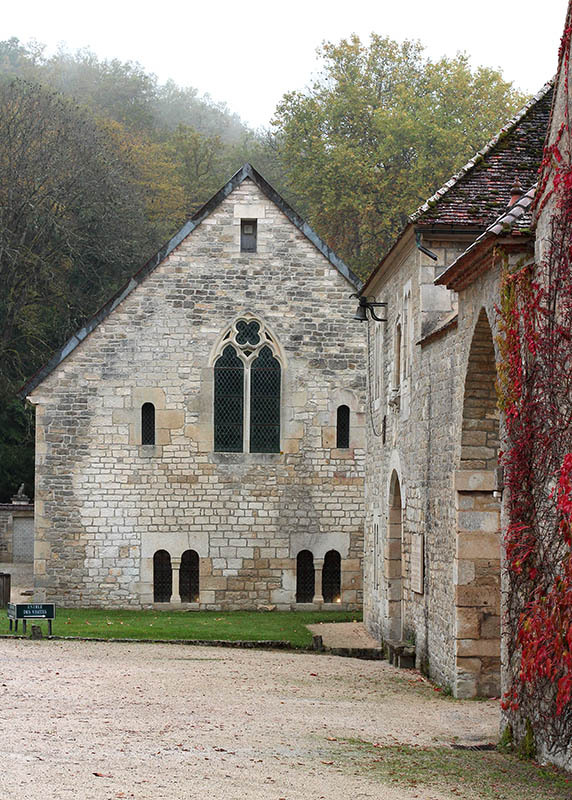 The church now dominates the high point of the town, but when it was constructed, it stood inside the walls of the château compound. Not much remains of the château today. I couldn't get far enough away to get the whole building in a shot without the wide angle lens. This photo works better in sepia than in color. But the church is still there and it has had a few renovations since the late nineteenth century. Each of the building's four gable ends is adorned with a sculpted cross. The one in the photo below is on the west front above the church's main entrance. 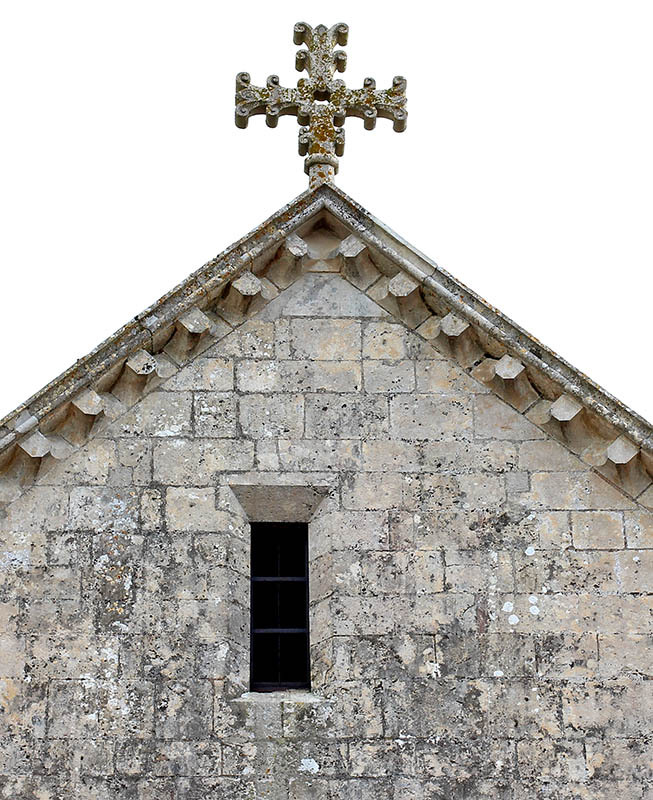 The cross on the western gable end. I don't know why the window is set off-center. The main doors are impressive and are quite wide for a church of this size. 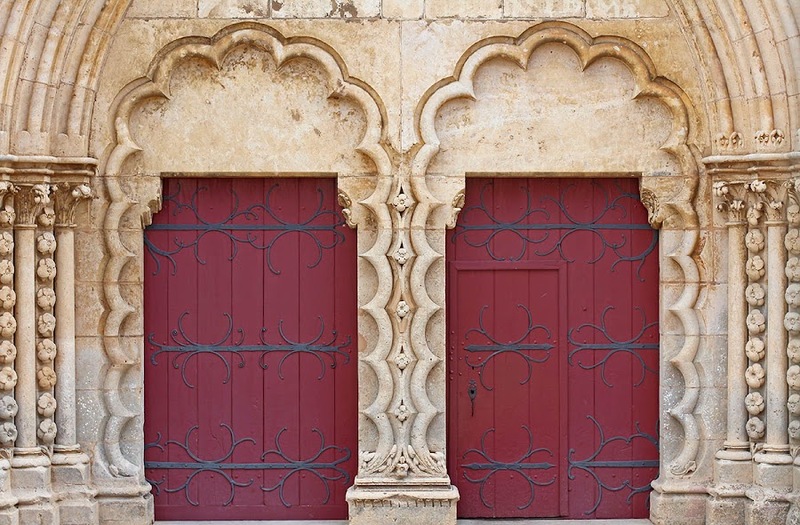 I read that the wrought iron decorative hinges are original to the twelfth century. What I read didn't say whether the doors themselves are original, so I assume they're not. The main portal, with original iron work on the doors. The sculptures that once occupied the space above the doors (just out of the photo) were destroyed during the French Revolution. Well, I see their graves. These are some of the graves in the churchyard in Montréal. There are very old ones and very recent ones. I noticed some of the dates of death were in the 1960s and I saw one that was from 2001. 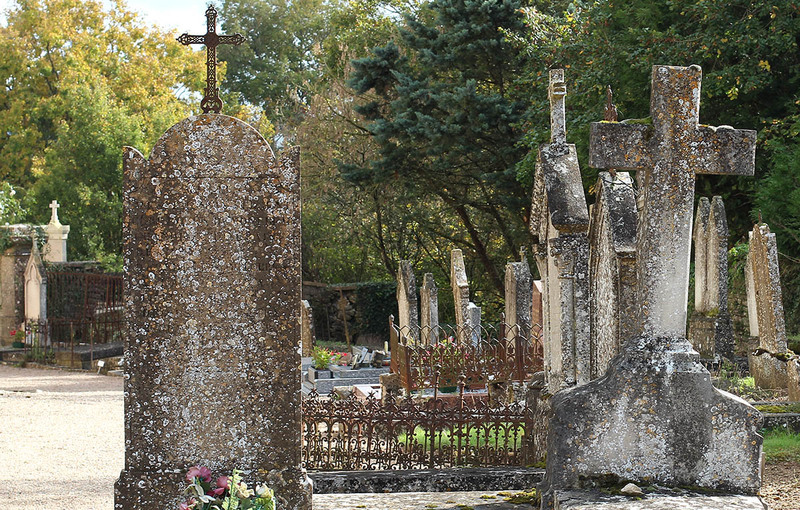 This is not an old, abandoned cemetery. 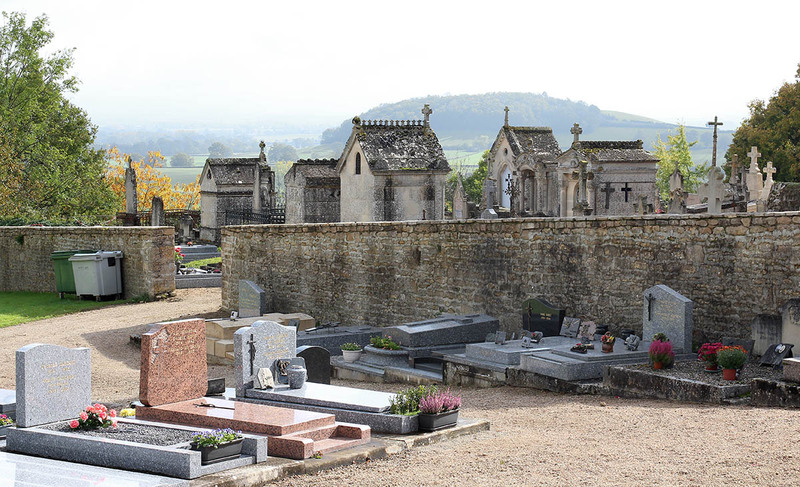 Newer tombs of fresh granite in the foreground. I went into the church to see what it looked like and to take some pictures while Ken stayed outside with Callie. Once I was done, I looked after the dog while Ken went inside. He took more photos inside than I did. 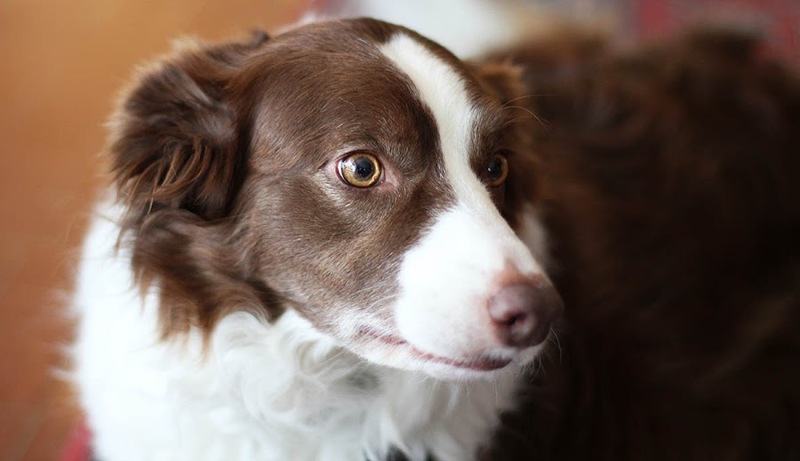 I had my 50mm lens on the camera and it's very restrictive in indoor situations. Churches are churches. I'm not religious at all, so I see them as architecture and cultural artifacts. Some French people see them that way as well, but others keep the faith, as it were. 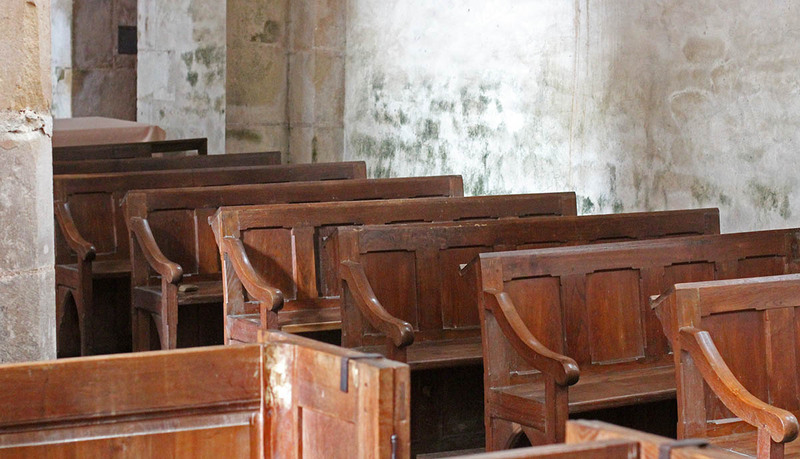 Most churches in France are more than historical monuments, they are living buildings with congregations that care for them as well as they can. 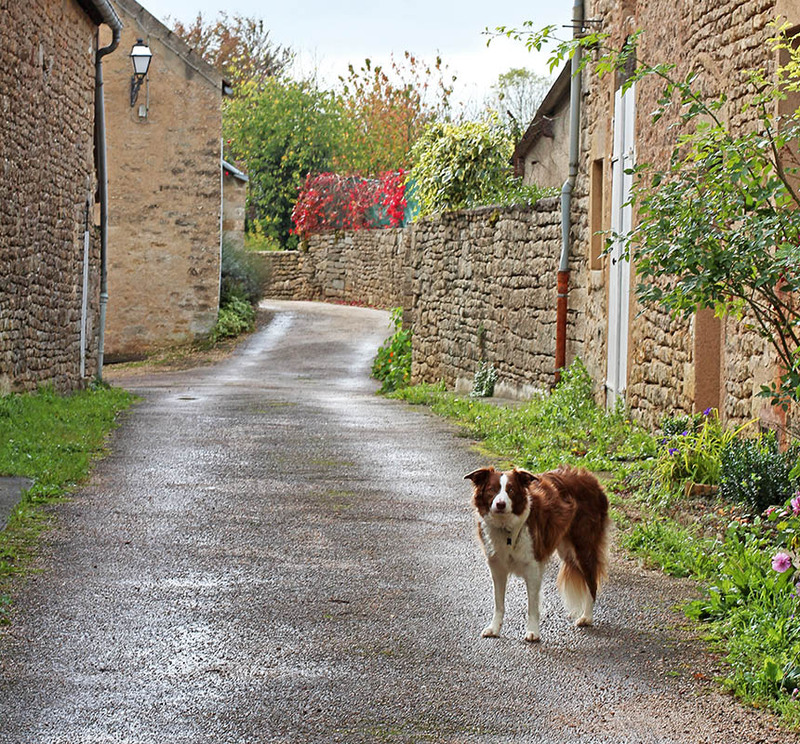 Here's Callie in the streets of Montréal (Yonne). There were very few people walking through town and virtually no car traffic so we didn't need to have her on her leash. She's very good about sticking close to us, but we kept the leash handy just in case there were people, other dogs, or cats about. Callie leads us through the back streets of Montréal. Callie still doesn't like to ride in the car, but she's much better at tolerating it than she used to be. She appreciates the opportunity to get out and walk around between long rides, and it's even better without having to be on the leash. 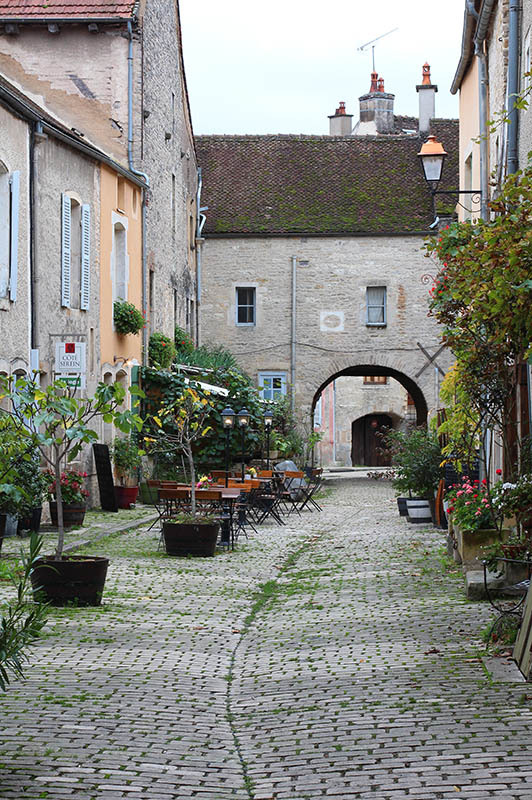 It's a little town perched on a hill overlooking the rolling hills of northern Burgundy. According to Wikipedia, the population is a whopping 192. There are six Montréals in France and most of them are in the south. This one is the farthest north. The view from the churchyard looking northeast toward the hilltop town of Thizy. Those are tombs in the foreground. Montréal seems like a tourist destination with plenty of vacation rentals available. The main street winds up the hill to the highest point where, what else, a twelfth century church sits. There is not much remaining of the old château (in fact, I'm not sure I knew there was one until I wrote this) which was demolished in the eighteenth century. The upper and lower gates in the old fortifications are still standing, however, and visitors must pass through them to enter the historic upper town. I have a few photos from Montréal to share, so I'll post them over the next few days. Looking into the abbey from outside the gates. We kind of got lost trying to get out of Montbard and onto the road for the abbey. One is never really lost in France, as all roads lead somewhere and it's not hard to find the right one. 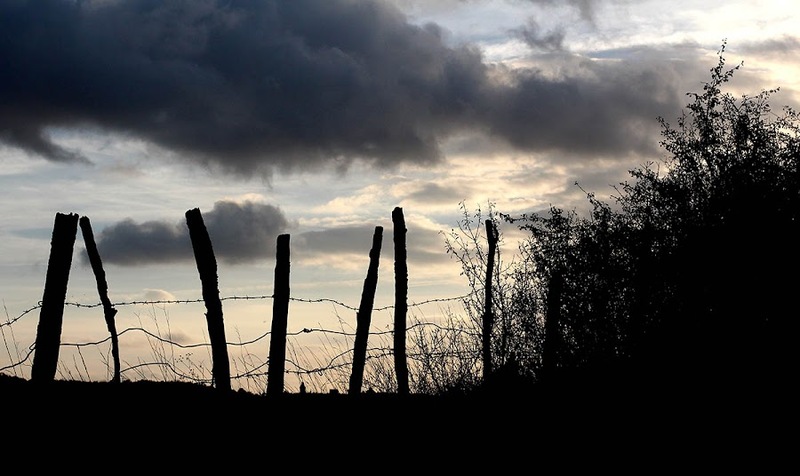 Still, we were driving in the rain and the roads were small ones, twisting and turning in deep valleys. We came upon a field of cows who regarded us with mild curiosity. Ken photographed them as they were on his side of the car. 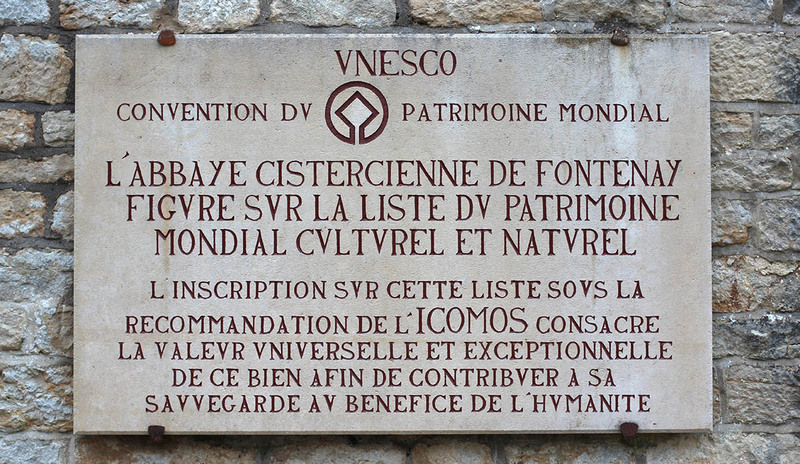 The UNESCO plaque at the abbey. It was designated as a world heritage site in 1981. So we arrived at the abbey and walked around outside. Because it was raining, we figured that the interiors would be dark and not very interesting for photos. And Callie was waiting for us in the car, so we moved on. We stopped to get gas and to buy a couple of sandwiches for a picnic lunch later on. And we got some wine while we were at it for dinner that night. 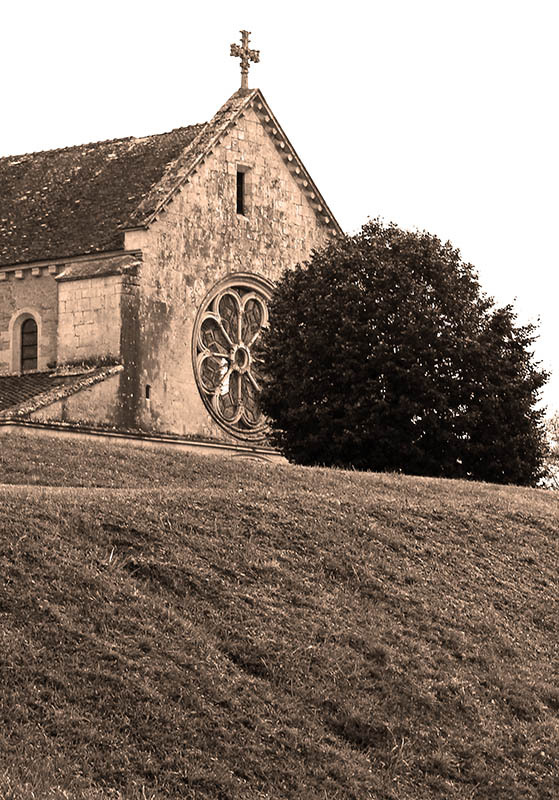 The abbey, built in the 12th century, is nestled in a deep valley, far from anywhere. In the wine aisle, I met a couple who decided to let me know which wines were good and which weren't. It was fun talking to them and they enjoyed advising a foreigner about what was good to drink. We all laughed, so that's a good thing. And they were right about what was good. Again, outside the gate, but still pretty. The gas tank filled, we headed farther south toward a town called Semur-en-Auxois. There was construction on the main road, but we drove in and through the historic center with its huge church and fortifications. Very pretty, but we didn't get out of the car. 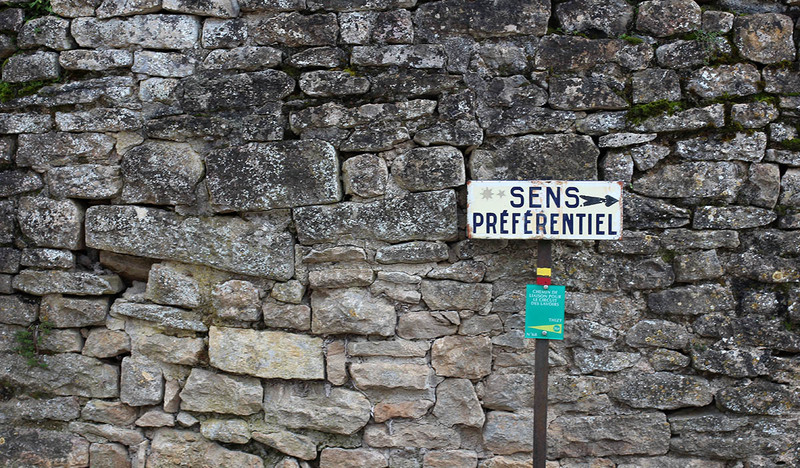 Then it was on to Epoisses, a town famous for its cheese. Part of the park outside the abbey. We got lost on the way, which is so unlike me. But still. 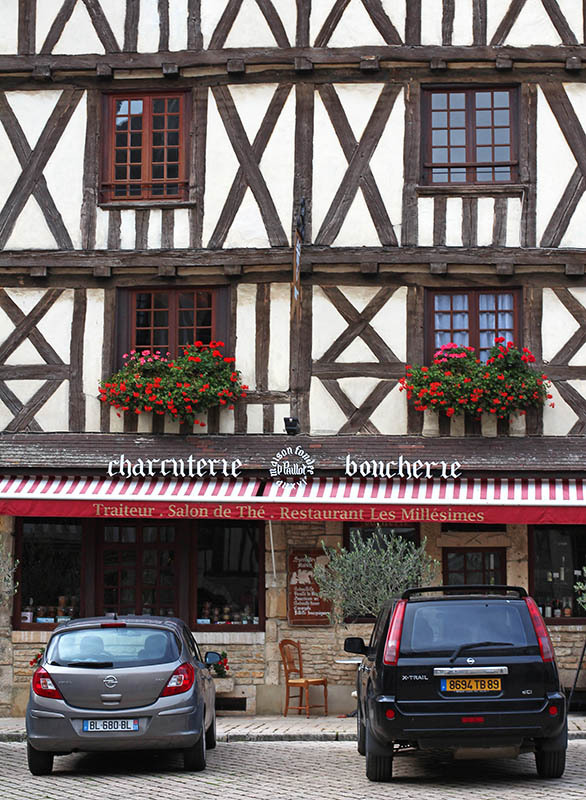 We stopped in Epoisses to eat our sandwiches in the shadow of the local château. Then we went on our way toward a town called Montréal. And the sun decided to come out for the afternoon. I'll stop with the vines after this. We did see other things in Burgundy apart from the vineyards, but I seem to have taken a lot of pictures among the vines. What can I say? 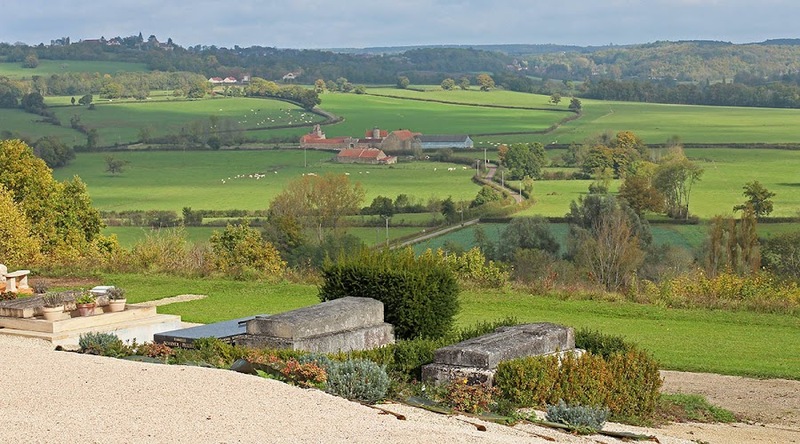 The first full day of our visit was to Chablis, Tonnerre, and Irancy. We spent the next (and last) full day visiting towns, mostly in the car, but we did take a walk with Callie in a nice place called Montréal. More about that later. The town of Irancy is nestled in a low spot among the hills. The church tower is just visible in the center of this photo. We had a good rain last night. I'll measure the amount in the rain gauge when it gets light outside (Update: I did. Fifteen millimeters). I built a fire in the stove yesterday morning and it kept us cozy all day. The new doors to the deck really make a difference; the old doors were single-paned and didn't seal well when closed. Of course, it's not particularly cold outside, but I'm still encouraged. That's what we're expecting on this first Monday of November. Then the temperatures are expected to drop to more seasonable levels. It had to happen. I feel good about getting most of the garden ripped out and our big burn pile burned up before it gets windy and rainy. This is from Burgundy a little over a week ago, but it will look a lot like this here today. The guy who cuts the hedges came by last week to look at the apple trees I want him to prune. While he was here, I made a deal with him to cut the rest of our firewood now that my twenty-one year old chainsaw is no longer cooperating. I had already cut enough firewood to get us through two or three months, so there's no urgency. I could buy a new chainsaw. However, we're thinking of replacing the wood stove next year with one that will take larger logs that we can buy already cut to size. If we don't replace the stove, we can still try to buy pre-cut logs, they will just be more expensive. My lumber-jacking days may be coming to an end. 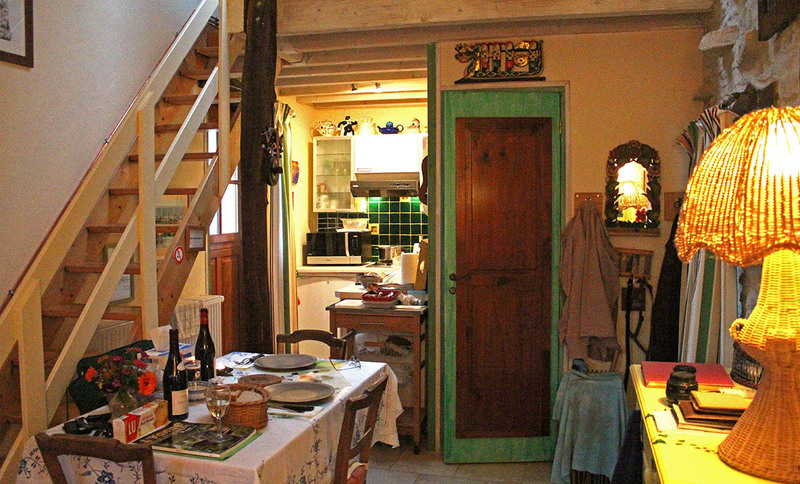 That means "the nest" and is the name of the gîte (vacation house) that we rented in Burgundy. As you can see, it was very cozy, but very comfortable, and we enjoyed our three nights there. The stairs were steep and the ceiling in the loft was quite low. We both bumped our heads more than once. 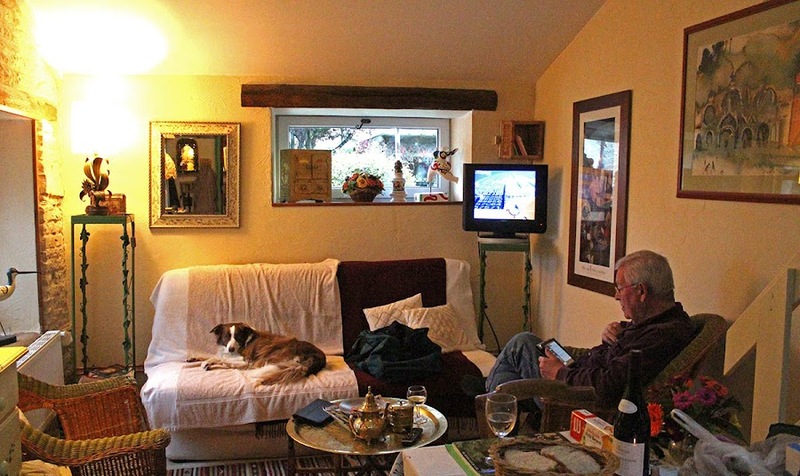 The living area had a big sofa and nice chairs, and we had internet access and television. Callie couldn't climb the stairs so she slept on the couch where you see her in the photo. We brought one of her big towels so that she wouldn't get too much hair on the sofa. The kitchen was well equipped and we ate most of our meals in the house. That's much more economical than going out all the time, and with the dog, it's much easier. The kitchen was small but nice, with everything we needed. That door on the right goes into the bathroom, the stairs go up to the loft bedroom. The owners lived in a big house right next door. They were a very nice retired couple, and the man used to work near where we live, so he knew our area. We enjoyed the stay and the accommodations and would recommend it to anyone interested. I needed to use my wide angle lens to get these shots, but it's the only time I used it on the trip. I just can't stop with the vines. 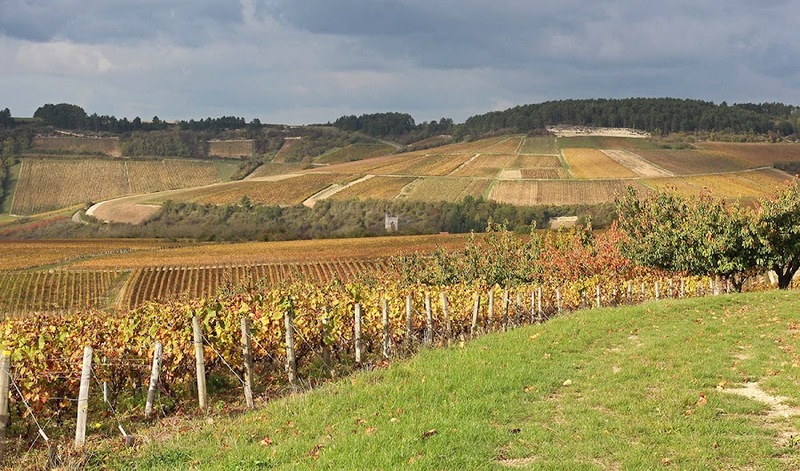 These are still the vineyards around Irancy in Burgundy. The topography made for some interesting views, I thought. And while I see the yellow and gold of the fall vineyards outside my window every day right now, I still enjoy these shots. Autumn on the slopes above Irancy. 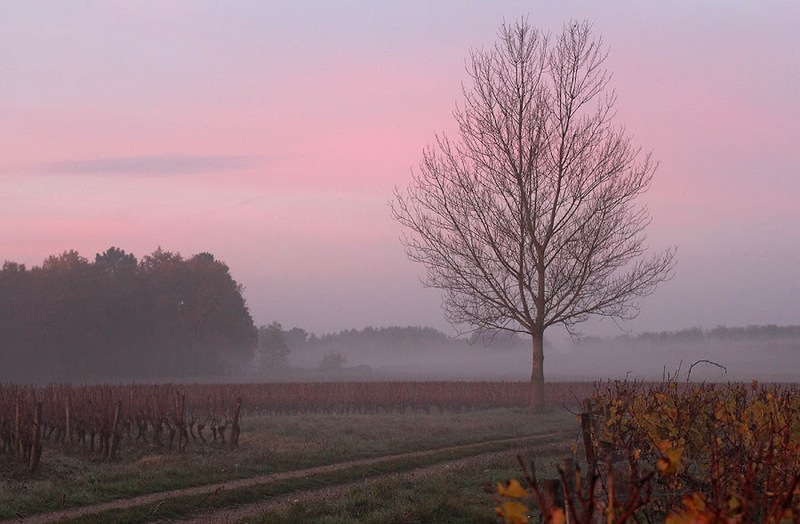 Soon, of course, it will all be a memory as the leaves fall to the ground and the pruning process starts. We're expecting some weather on Monday with wind and rain. The beginning of the end, I suppose.